Updated: 12:45 p.m. | Posted: 6:50 a.m.
Gov. 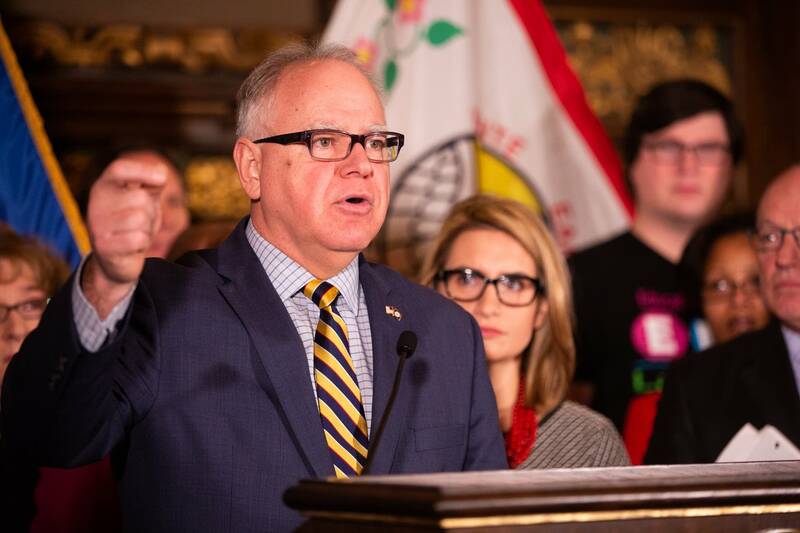 Tim Walz announced Tuesday morning that his administration will continue an appeal of the Line 3 oil pipeline begun by his predecessor. Last summer, state utility regulators approved the controversial project. Enbridge Energy plans to build a new $2.6 billion pipeline across northern Minnesota to replace the existing Line 3, which is aging and corroding. • Share: What are your thoughts on the Line 3 pipeline? But former Gov. Mark Dayton's Department of Commerce appealed that decision. An appeals court ruling last week meant the Walz administration would be forced to decide whether to file its own challenge. Walz announced Tuesday that his Commerce Department will file a petition for the state Public Utilities Commission to reconsider its decision in approving the controversial project. The move opens the door for a new appeal process. "When it comes to any project that impacts our environment and our economy, we must follow the process, the law, and the science," the governor said in a news release Tuesday, saying his administration would continue his predecessor's appeal as part of that process. Walz said projects like Line 3 "don't only need a building permit to forward, they also need a social permit." He said his administration had met with groups on all sides of the issue, something Lt. Gov. Peggy Flanagan echoed in the release Tuesday. "As this process goes forward," Flanagan, who has opposed the pipeline's route through Ojibwe treaty territory in northern Minnesota, said in Tuesday's release, "our administration will continue meeting with Minnesotans passionate about this issue and engaging in meaningful consultation with affected tribes." 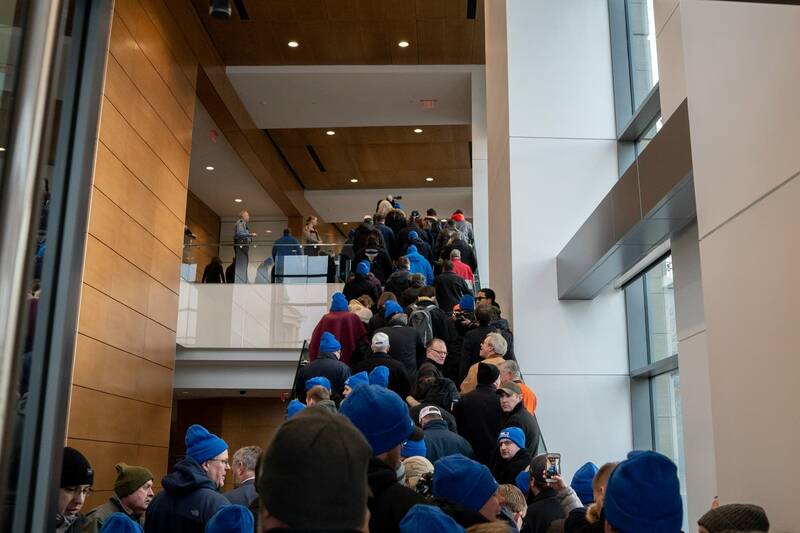 In a news release after Tuesday's announcement, the group Minnesotans for Line 3 expressed frustration over the Walz administration's decision. "The facts and data will not change, regardless of how many times they are reviewed," the group said in a statement. "The only thing this needless appeal does is to create ambiguity in what has been a clear and robust regulatory process." Why is the future of the Line 3 project still in question? Even though the Minnesota Public Utilities Commission approved the Line 3 replacement proposal more than seven months ago, Enbridge Energy hasn't yet received the final approvals it needs from the commission before it can begin construction. 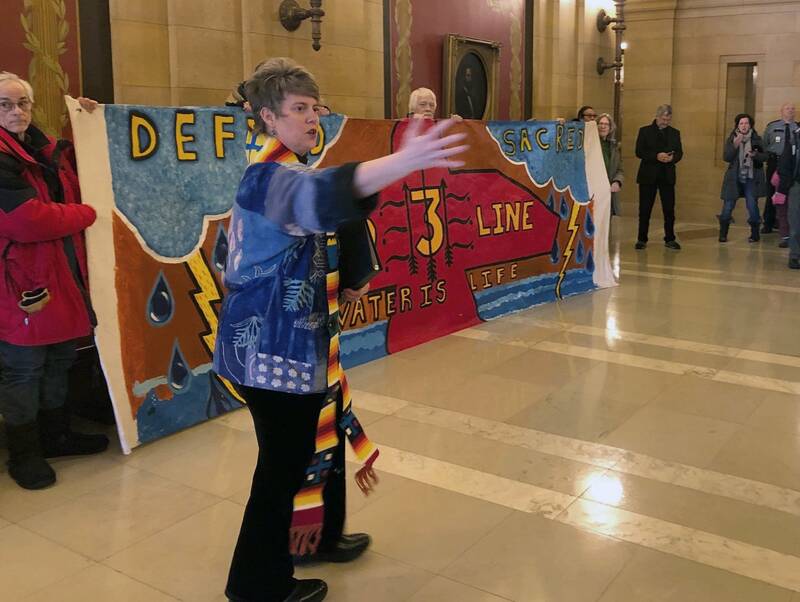 When the PUC granted Enbridge a Certificate of Need and route permit to build Line 3 last June, it also imposed a number of conditions on the project — including the creation of a trust fund to pay to remove the pipeline when it's out of service. It's taken several months to work through those details, a process that's still in progress. Enbridge also has yet to secure several permits it needs from the U.S. Army Corps of Engineers, the Minnesota Department of Natural Resources and the Minnesota Pollution Control Agency before it can begin to build the replacement pipeline. The project has proven enormously divisive. Just last week, four activists broke into an Enbridge site along the current Line 3 pipeline and tried to shut off the pipe. They said they did it as a way to address climate change, and the pipeline's contribution to global warming. And since the PUC's approval of the pipeline, several tribes and environmental groups, as well as the Minnesota Department of Commerce, have filed appeals challenging the decision. What's the status of those court challenges? In December, several environmental and citizens groups and tribes — including the White Earth and Red Lake bands of Ojibwe, the Sierra Club, Honor the Earth, Friends of the Headwaters and the Youth Climate Intervenors — filed challenges to the project at the Minnesota Court of Appeals. Then the Minnesota Department of Commerce, in the waning days of the Dayton administration, filed its own appeal. The Commerce Department argued that, during the PUC regulatory process, Enbridge failed to prove that the pipeline is needed in Minnesota, because it didn't provide an oil demand forecast that's required under state law. Dayton supported the department's appeal, saying in a statement that Enbridge "failed to demonstrate that Minnesota needs this pipeline to meet our future oil demand. In fact, most of the product would flow through our state to supply other states and countries." But last week, the Minnesota Court of Appeals threw out those challenges, ruling that they had been filed prematurely, because the Public Utilities Commission has yet to issue its final order approving Line 3. What has that meant for the Walz administration? Before the appeals court decision last week, Gov. Walz needed only to decide if his administration would allow his predecessor's appeal to continue. But once the previous Commerce Department's appeal was rejected, the Walz administration had to determine the stance it would take on Line 3, and whether or not it would file its own appeal. The first step in that process was to file the petition for reconsideration at the PUC that the Walz administration announced Tuesday. If the commission denies it, a challenge can then be filed at the Minnesota Court of Appeals. Walz started feeling the pressure to take a stand on Line 3 almost immediately after he took office. On one side are the project's supporters, mostly pro-industry and labor groups, and Republicans in the state legislature. They pushed the governor to drop the Dayton administration's appeal and let the pipeline move forward. And they've pushed him to encourage stage agencies to issue the remaining permits. Before Tuesday's announcement, state Sen. Majority Leader Paul Gazelka urged Walz to take a pragmatic approach. "There are Democrats in the north, as well as Republicans, who say this is really important for our communities," he said. On the other side are the pipeline's opponents, mostly environmental and tribal groups, who first lobbied for Walz to allow the original appeal to continue, and then began urging him to file his own appeal. How have the two groups been making their cases? 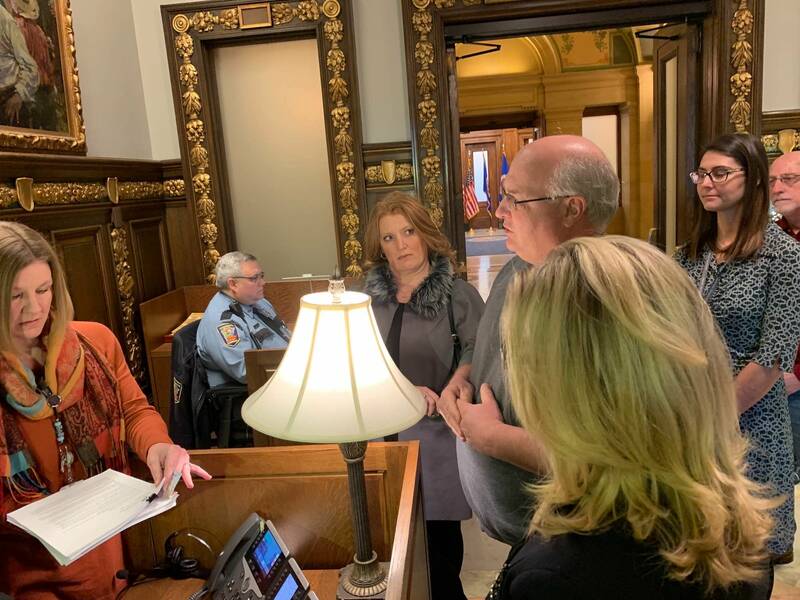 Both sides have written letters to Walz and have visited his office. And for both sides, it's a test of the new administration. Pipeline opponents have held rallies and a candlelight vigil outside his residence. They argue that, if Gov. Walz is as dedicated to fighting climate change as he's said he is, then he must fight Line 3. The pipeline would transport about 760 thousand barrels of oil a day, which, when burned, would emit a large amount of carbon dioxide, one of the greenhouse gases that contributes to climate change. "It's an appeal that was started under Gov. Dayton, and it's an appeal that absolutely should finish under Gov. Walz," Andy Pearson, who works with the environmental group MN350, said Monday. It's "really a bare minimum of what we should expect from a team that says they care about science, that they care about climate, that they care about these issues," he added. On the other side of the issue, a group of 76 mostly Republican state lawmakers sent Walz a letter on Friday, encouraging him not to pursue an appeal of the Line 3 project. They highlighted the property tax revenue it would generate for the northern Minnesota counties the pipeline would pass through. Rep. Dan Fabian, R-Roseau, who signed the letter, said Monday that Enbridge provides nearly 20 percent of the property tax revenue for Kittson County. He also pointed to the thousands of construction jobs the project would likely create as the pipeline is built. "When these construction crews move in, they bring in a lot of dollars, and they spend them in the hotels, restaurants, hardware stores, gas stations, liquor stores and cafes," he said. Proponents say a new pipeline would be a safety upgrade over the old one it would replace, which has had a long history of past spills. "The fact of the matter is Line 3 is corroding, and the safe delivery of energy product on which we all rely is dependent on its replacement," U.S. Rep. Pete Stauber, who represent's northern Minnesota's 8th District, said in a news release after the announcement Tuesday. Stauber called Walz's decision to continue with the state's challenge "misguided," saying the Line 3 project is "a win-win for Minnesota." MN350's Pearson described the decision as "the first test that the Walz administration has had about whether they're serious about addressing climate [change] and indigenous rights through this Line 3 issue." How can two state government entities — the PUC and the Commerce Department — have such different views on Line 3? 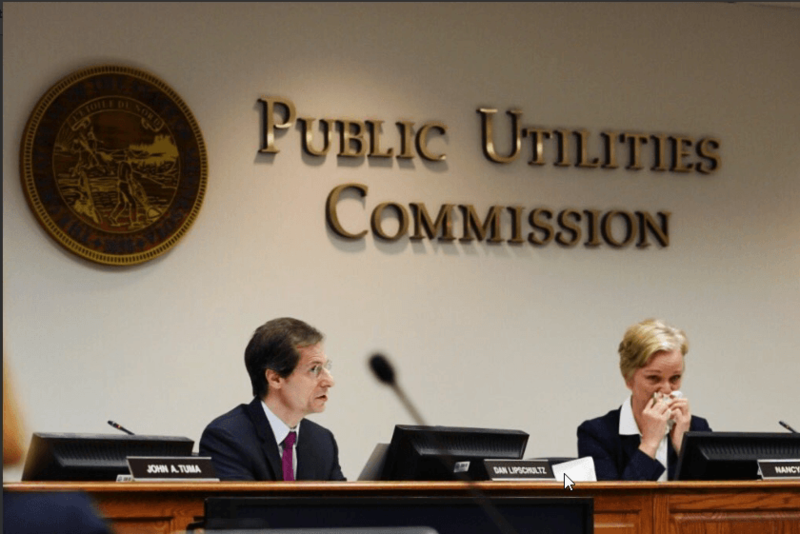 The Public Utilities Commission is an independent, quasi-judicial board that has regulatory approval over large energy infrastructure projects, including pipelines. Its members are appointed by the governor, but do not work for the governor. The PUC has defended its unanimous approval of the pipeline, saying it was based on the applicable law and a full evidentiary record, with a lot of input from the public and involved parties, including the state Department of Commerce. The Commerce Department's role during the proceedings was to advocate on behalf of consumers and the public interest. In the case of Line 3, department representatives argued that the potential costs of the pipeline project outweighed the benefits, and saying approval of Line 3 was not in the best interests of Minnesotans. What happens next with Line 3? Environmental groups and tribes whose earlier appeals of Line 3's approval were rejected by the court will also likely file petitions for reconsideration at the Public Utilities Commission. The PUC must then schedule a hearing to decide on those petitions. If the commission again denies those petitions, the Department of Commerce and others could then refile their appeals at the Minnesota Court of Appeals. Groups have also filed separate appeals challenging the state's approval of the environmental review of the pipeline, and are also expected to challenge the PUC's approval of its route permit. In the meantime, Enbridge is still awaiting permits from the U.S. Army Corps of Engineers, as well as the Minnesota Department of Natural Resources and Minnesota Pollution Control Agency. The company says it plans to begin construction this spring and have the pipeline built by the end of the year. But many opponents have pledged large protests if construction does begin.